Over all I loved it. Very neat design and location. Looks like an Old Mexican Ranch in the middle of Old Town. Very crappy and dangerous crib. 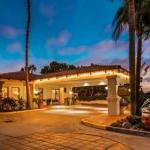 The hacienda is a gorgeous complex, right in heart of old town san Diego. It is extremely easy to get to from the freeway, and is about 2 minutes from the trolley which can get you almost anywhere downtown. We did not need to use our car for our entire stay. The rooms are nice, the view is good, and the food was outstanding. We ordered the sampler platter for $9.99 and it filled us both up. I'd highly recommend staying at the hacienda best western if you want to be near old town / downtown san Diego. Buy an all-day trolley pass, and enjoy not driving during your stay. Right in the heart of old town. Extremely easy access to surrounding attractions. $12/day additional cost to park not reflected in price. Excellent location and the tastes of the Old Spanish ways are what makes Best western Hacienda Suites Old Town unique. With its lounge area with rocky walls, inviting fireplace and thatched roofs, the hotel blends with Old Towns colonial architectural style. The traveler is near everything, at a walking distance. The area boasts some of the best restaurants in town and some feature live Latino music. The hotel is really big and spreads out on a hill. Business travelers will find attractive features in the business services available. Fun travelers can lounge beside the outdoor pool after a day of sightseeing and shopping or as they get ready for the night. The rooms give you several reasons to relax: watch cable television or rent a movie that you can watch on the VCR. The rooms include coffee and tea maker, microwave and refrigerator. If you are a business traveler, make your locals calls from the room, they are free if under thirty minutes and have free access to long distance calls. If you need more space, ask about the suites, there are 19 to choose from. The hotel includes 9 rooms for the guests physically challenged. A free shuttle takes guests from and to the Airport, a courtesy vehicle services the Amtrak railway station upon request. Stop by the 24 hour front desk and ask about the sightseeing tours. If you are organizing a conference, the hotel offers audiovisual equipment, conference and meeting facilities and catering services. Business travelers wil appreciate the fax, shipping and copying services. If you travel for fun, stop by the cocktail lounge or visit the exercise facility. Parking: Yes, there is parking. They charge $12 a day.